According to Buddhist and Hindu beliefs, the Himmapan Forest, said to be geographically located in the Himalayan Mountains, forms the only connection between heaven and earth. This magical forest is home to an assortment of unique creatures with supernatural powers. Along with these creatures were 10 majestic elephants led by the mighty Erawan. The legendary forest was described in Trai Bhum Pra Ruang, a Thai Buddhist epic written during the Sukhothai period (1345 A.D). The Himmapan Postcard & Cut-out Statue is a set of Eco design postcards that can be easily cut and folded into little elephant statues that you can send to any part of the world all the way from Thailand. Made from recycled material, it comes in four different elephant designs that bring their recipients felicity, tenacity, longevity and prosperity. They come in these adorable vibrant colors that people of any age are sure to love. 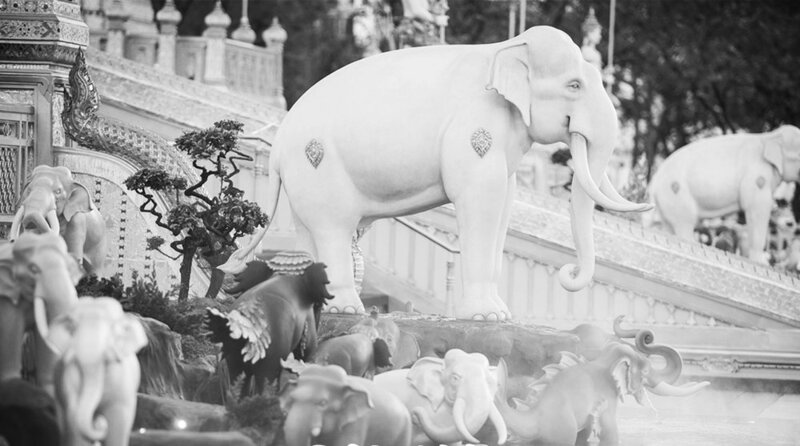 One of the ten benevolent elephants in the Prom-Pong clan found in Trai-Bhum-Phra-Ruang, a Thai Buddhist epic, its body is as white as the snow that covers the peak of Mount Kailash. This royal elephant’s crown symbolizes its wealth and influence. Bun-Torn-Hud-Tee brings wealth and prestige. This is one of the ten benevolent elephants in the Prom-Pong clan found in Trai-Bhum-Phra-Ruang, a Thai Buddhist epic. It is very powerful with an elegant, scarlet body. This elephant wears Phuang-Malai—a type of floral wreath—around its neck. Phuang-Malai is traditionally used in its honor to help overcome life’s obstacles. Chat-Tan-Hud-Tee brings fortitude and strength.